Hostel Cuernavaca sells itself as a family-run hostel, and that's exactly what it is. Run by Alicia and her husband, this is a converted family house with a brand new second bungalow. 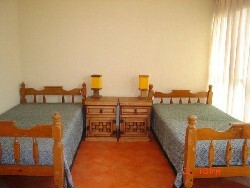 The hostel has a pool for balmy summer days, a BBQ pit and fully equipped kitchen. It's located a ten minute taxi ride north of the Cuernavaca zocalo. I visited after the tourist season and was the single guest there. This meant that I had a good chance to speak with the family and get to know them, and a little more about living in Mexico and what to do in Cuernavaca. They gave me plenty of tips on the city and where to go. Coming back after an evening out, I found myself sleeping in a very comfortable bed (better than at home!) and a good hot shower in the morning. The hostel is very clean and well taken care of. As an added bonus, breakfast is included when you stay here. The athmosphere should stay nicely laid back and homelike even at full capacity. Not a place for the party crowd, but rather for the road-weary backpacker in need of some home comforts, or older travellers on a budget like myself. A great stay, I can't recommend it highly enough. Last updated by jack on 25 April, 2007 in Lodging.